Buses from Uyuni run twice a day to Potosi and Sucre – 9:00am & 9:30am, and 6:00pm & 6:30pm – with each, morning and evening services run by different companies. 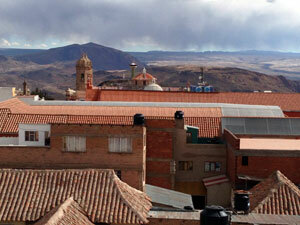 It takes 3 hours along the B5 highway to reach Potosi, with a one 15-minute stop. Right outside the bus station in Uyuni, you will hear women shouting ‘Potosi, Potosi’, calling for passengers and the bus will be filled soon, so make sure to reach there at least half-hour before departures. If you have a planned trip then book your tickets the previous day for a better front-rows seat. The road is not bumpy at all on the brand new B5 highway, but considering the conditions of the bus (at least the one I got! ), it’s best to sit in the front seats. I was impressed looking at the semi-luxury bus that I will be traveling to Potosi in, but at departure time, the bus did not have enough passengers to I was transferred to a taxi-mini-bus. The journey to Potosi was completed in just less than 3 hours, and I arrived at the Nuevo Terminal up north in the city. Getting a taxi from the bus terminal to the city center is not easy, with almost all of them heading to Sucre. After asking a few locals around, I was asked to walk up to the main street and try my luck. And after 20 minutes of waiting, I stopped by an internet cafe nearby for one last inquiry before I call my hotel and ask for help. The man at the cafe was helpful to walk out with me, stop a random car and ask them if they can drop me to the hotel in the city center. Lucky for me, the couple in the car agreed for Bs 10! I gladly jumped in. Because of some weekend festival in Potosi, the streets were filled with students in white uniforms marching in a fiesta form, playing their instruments. This took the usual 20 minute ride to the hotel really long, but it was past 1pm when I reached the Tuko’s La Casa Real hostel. 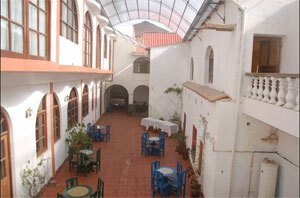 With its massive front courtyard, this is a fabulous boutique hostel very much in the city center. This family-run hostel has some rooms that are airy with a window, but most of them are basic with clean bathrooms and hot showers available all day. Breakfast is included in the price, and is sumptuous and filling. Wifi is available across the hostel. 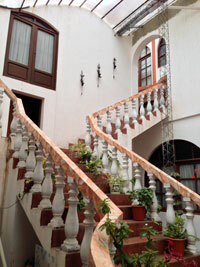 This is not your regular party hostel, but very quiet; and has great views from the rooftop. 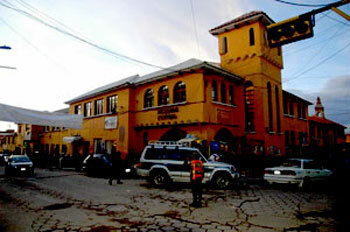 The staff is friendly, English-speaking and helpful to book taxis and mine tours. Prices range from $20/$32/$40 a night for single/twin/triple bedroom. 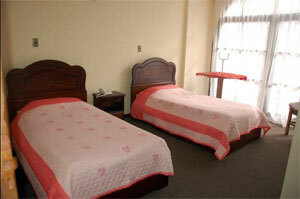 Good location, clean rooms and friendly staff make this one of the best places to stay in Potosi. The first thing to do was book the cooperative mine tour for next morning that costs Bs 100 for a 2-3 hour tour. 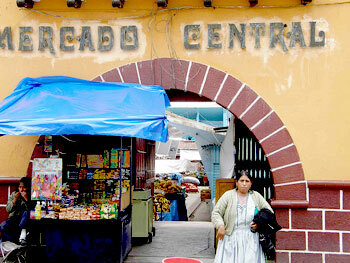 All the sights to see in Potosi are centered around the main square and leading up on Calle Ayaucho. Being a weekend, most cathedrals were closed. So I decided to wander around the town and visit some other spots. 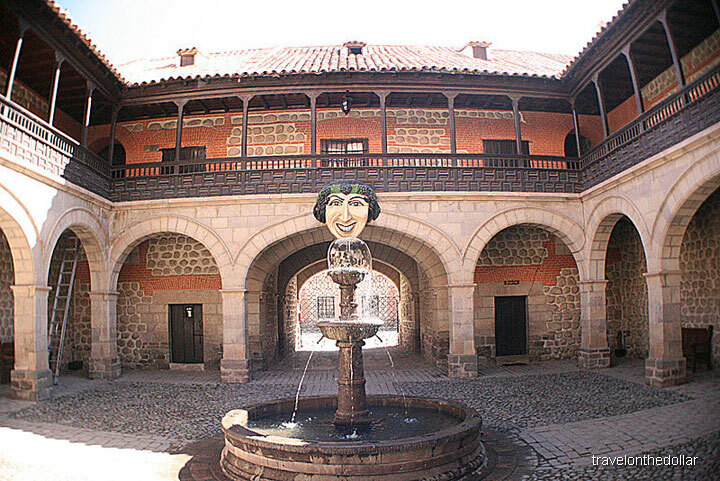 First on the list was Casa Nacional de Moneda (Entrance: Bs 40, Closed Monday), which is a former royal mint of Bolivia and now a museum of a collection of religious art, contemporary art, and artifacts from its time as mint. 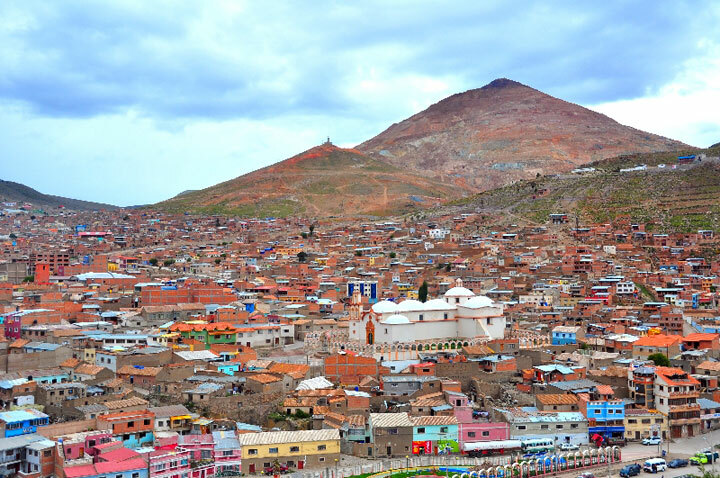 After checking in with some locals on things to do in Potosi, one man recommended visiting the Saturday markets at Mercado Central, two blocks from the main square, and getting a taste of the local cuisines. Although the market was packed with hardly any space to move around, the food were delicious! The Sun was setting in by the time I finished savoring the delicacies in the market, so I took a taxi to the panoramic viewpoint of Potosi right next to the mines. Back to the town, I wandered around for some good restaurants for dinner, and realized that most of them close doors at 7pm. So got in to the only one open, called Hawaii, for some fried chicken with rice. Not good at all! The food was terrible and greasy! 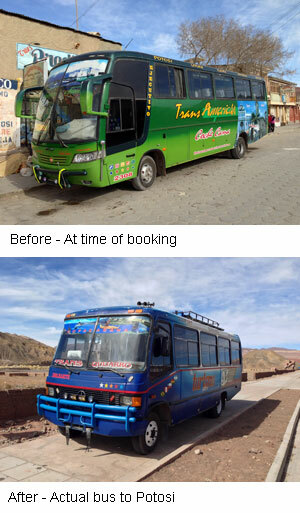 Bus from Uyuni to Potosi Bs 30 or $4.35 One person, one way.